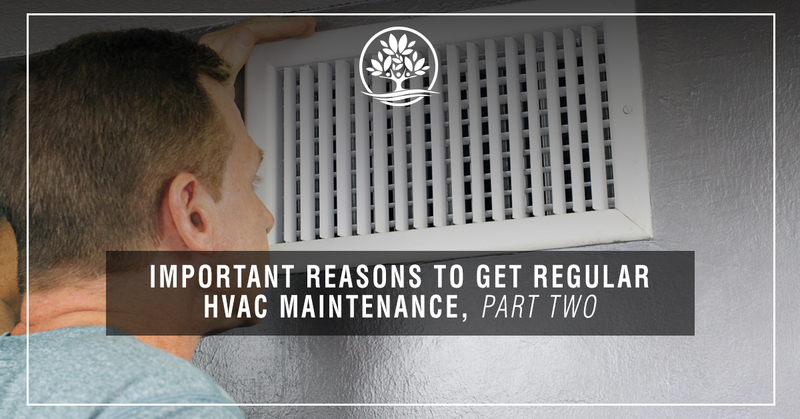 Welcome back to our blog series on the importance of regular HVAC maintenance! Your team of professionals here at Legacy Heating and Air Conditioning Services in New Braunfels love this time of year because we’ve found that springtime is when we can show this community how much we can help. With the changing weather, we’re often bombarded with countless allergies changes in air pressure. We specialize in making sure that you always enjoy the best air possible when you’re in the comfort of your own home because we know how important your quality of life is to you. Contact us today for all of your heating and cooling needs! In our previous blog, we discussed the importance of regular HVAC maintenance for some extremely significant reasons. It’s valuable to get your units inspected regularly because your system will perform better, and you’ll avoid much bigger issues down the road. Continue reading below to learn more about the reasons to get regular maintenance performed on the HVAC in your New Braunfels home. When you’re getting regular inspections of your HVAC machines, you’re ensuring that if a small problem does exist, you’re getting it taken care of immediately, and when this happens, you’re avoiding the frustrating and inconvenient annoyance of needing to have your units down for multiple hours or even days at a time. Depending on the time of year you have to have this large-scale air conditioning repair or all-out replacement, the time needed to get the job done might be an uncomfortable time for you and your family. Calling your New Braunfels AC repair professional is a great idea if it’s been a while since you had your unit looked at or you’re noticing any other significant changes. As we’ve stated above, taking care of small issues when they crop up will absolutely help you avoid having to replace your entire unit. It’s always unfortunate for us to have to replace air conditioners that are less than five years old or furnaces that are less than seven. Since units are supposed to last so much longer than this, I’m sure that you can imagine how frustrating this must have been for our New Braunfels clients. In many of these cases, replacements could have been avoided with a simple yearly inspection. Since the worsening of our home’s air quality is something that usually happens incredibly gradually, it’s normal not to notice those changes. When you start to develop respiratory issues, asthma symptoms, or allergic reactions when you’re in the comfort of your own home, the reason is usually due to a lack of decent air quality. This can occur from a number of different causes, including an overly dirty filter, a broken fan, a blockage, and more. Many of the issues that would cause your air quality to decline have fairly simple solutions, but when you’re not getting regular service and maintenance, you’ll have no way of knowing when a problem might be present. One of the best reasons to get regular maintenance on your HVAC is to save money when it comes to those electric or gas bills. When your machines are functioning the way that they were made to, you’re getting the best bang for your buck. But problems that your HVAC maintenance professional would catch could be the cause of frustrating amounts of your money. As homeowners, we have a responsibility to make sure that our property retains as much of its value as possible. For this reason, regular maintenance on all of your home’s structures and appliances must be taken extremely seriously. Waiting until something is broken is the wrong time to schedule maintenance on your expensive appliances; that’s why it’s so crucial that you have your HVAC systems inspected on a regular basis. When the time comes to get vital maintenance performed on your air conditioning unit or furnace, it’s important that you know who to call for professional service. Legacy Heating and Air Conditioning Services in New Braunfels is your best option for any and all air conditioning and furnace repair and replacement needs. Contact us today for HVAC service near you!